TV doesn't have to be all about talent competitions and reality shows. Back in 1980, Carl Sagan, America's favorite turtle-neck wearing, smooth-talking scientist brought us Cosmos: A Personal Voyage. The thirteen part series focused on a range of scientific subjects, from space to the origins of the human race, and became a public television success. The material was educational and interesting, but the backbone was Sagan himself, a lovable optimistic host who saw endless possibility in scientific exploration. So it seemed unlikely that, with Sagan gone, the series would ever get a reboot. Enter: the charismatic Neil deGrasse Tyson - this generation's favorite scientist. 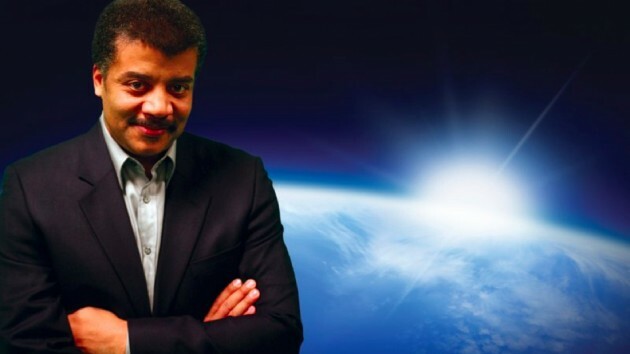 Tyson hosts Cosmos: A Spacetime Odyssey at 9pm Sundays on Fox. The primetime special opened with an introduction from President Obama, which you can watch here. Clearly, it's a big friggin deal! Much of the magic again comes from the host. Tyson maintains a hilarious, insightful Twitter account. Tyson, President Obama, and Bill Nye the Science Guy took a selfie that went viral a few weeks ago when the science icons took a trip to the White House. He's the perfect candidate to bring educational programming back to primetime. He matches Sagan's love of science and hope of possibility. Tyson has a personal connection to the man and the series. In the first episode, Tyson tears up as he describes meeting Sagan as a teenager. The series reboot gets the big network treatment - grand green-screen, a theatrical orchestrated soundtrack, and some Disney like animation for the historical parts. The result is pretty thrilling. Where the original Cosmos lacked the bang in the Big Bang, the new version has all the flash of a modern movie spectacle. We hope Cosmos kick starts a return to primetime educational programming, the kind of programs that both parents and kids can watch, learn and be inspired by. Science doesn't have to be exiled to the Science Channel. Cosmos: A Spacetime Odyssey airs on Sundays at 9pm on Fox and on Mondays at 10pm on the National Geographic Channel. It's pretty cool that after 30 years, this show was able to come back. This isn't the type of show that I'm interested in, but for those who are, it's a big deal. I think that a lot of people think that science is boring, and if you can put a spin to it, it may interest a lot more people. I agree, and many people are into it so it's clearly doing well so far. I agree. It is pretty cool that this show came back. Hopefully it does well. I agree, especially with the educational part of this show. I agree with you and it is great. Hopefully people will start watching it and become educated on the world they live in. I am in total agreement with you opinion! I think that the show will be a great way for anybody interested to learn about things like this. I think this show could be very educational and a great way for people to learn. I agree, maybe it could be used in science classes or something. This show seems to be interesting and a way to actually learn. Hopefully it does well with its new host. I recently watched the premier of Cosmos on Fox and I would have to say that it was very interesting. Tyson takes you on an adventure in a spaceship describing all of the distant planets. Then he explains what the Cosmos is by relating everything he has recently talked about. It was very interesting. Cosmos was a great informational series on science and space exploration. It's cool that a show like that can come back and maybe draw attention and put a digital spin. I think that it's really cool that important, well known people are interested in this show. This show seems to be not a pointless show and have some actual educational purpose too it. Therefore I think that families will enjoy this show together & actually get something out of it. I think that there should be more educational shows on the air. Humans love to learn (whether they think they do or not), and television is one of the greatest mediums to convey knowledge. These new shows should help Americans learn (or relearn) the things that they were supposed to learn in school. But unlike school, these shows use excitement to convey knowledge. I would willingly watch a day of the Science Channel than sit through a 98 minute lecture on Chemistry. Hopefully this will spark Discovery, National Geographic, and especially the History Channel to stop the reality shows and go back to educational programing. I think this is a great show and I'm really glad programs like this are making a comeback with shows out there like Ice Road Truckers and things of that nature, it's hard to find space-based television shows that are interesting and insightful without a boring voice. NDT is a great host and he gives the necessary enthusiasm that shows like this needs- much like Bill Nye bringing life to high school science classrooms. I think it's great that Cosmos got a reboot. Space is such a cool thing. Tyson is a pretty rad dude too, so I think it's great that he's hosting it. Hopefully, this generates a good audience. There are educational shows on tv only problem is people would rather watch jersey shore or the walking. you can learn a lot from the science channel, history channel, even discovery, but people find those shows boring. I think that this show can do really well, and it must've back in the 80's in order for it to come back. I also think it could be very educational. If this show continues to be successful, hopefully it will promote more educational learning in modern and interesting ways. I watched the show and was just amazed by it and thought it was awesome. It was extremely interesting and kept my attention for the entire show. I enjoyed the way that the info was presented, and how the show came back. Educational shows like this should be on television more that what is on now. This can potentially help educate anyone who watches t.v. and provide easy, or complex answers for what the person is feeling, or is experiencing in their life. I actually was talking to someone the other day who was excited about thins. Its not for me, but im glad people are excited about it! It is unbelievable how long some tv shows can last. Popularity is remarkable and even though im not personally a fan of the show it will probably be a hit. I think it is terrific that they have brought the show back! It seems that it would be a very educational television show that is good for young kids and there parents! I hope that the show becomes very popular so it will teach young minds or anybody interested. Its Good That They Have An Interesting, Educational Show About Science, Its A Way For People To Learn New Things About A Subject That Is Usually Boring For Most People . i mean i think its cool that they made a come back! !